These late summer evenings pull at my heart strings in ways I’m unprepared for. As it gets darker earlier each day, I find myself walking out into the golden light to listen to chirping birds and traffic that sounds like the ocean. Just as the light begins to recede, it colours the tops of the trees in fiery hues of yellow and ocre mixed in with the darkest leaf greens. The ground is parched (I refuse to water the lawn) and the sky is blue. The temperature starts to drop after a day of heat and this natural A/C fills the rooms – that were stifling just a few hours earlier – through the backdoor and cracked-open windows. I am floating. I’m trying to think of the most poetic way to explain how sad I am that summer is almost ending. I want to grill food outside forever and drink iced beverages sitting off the edge of the deck. In the same vein, I am ready to slow down a little. To me, that’s what shorter days mean. While I’m not really looking forward to the cold, I’ll find joy in it somehow. Slow, deep soulful tunes, warm beverages on tap, soups on tap and a heap of blankets on the couch. Until then, I’ll have plenty more summer in my glass, please. Meet me in the backyard. This recipe is part of the Drink The Summer virtual party some food bloggers are in on all day today. Millions of cocktails will clog your eyeballs all day and you may or may not curse at us but really, you should find one you love and make it your own. You can find the whole list right here or on With Food and Love, Sherrie’s wonderful blog. This recipe was born out of a story an aunt told me about how she makes sun tea in the summer time. It doesn’t get as hot here in Washington but it was hot enough last week for me to make my own sun tea. That plus I have so many herbs growing like crazy in this heat. Maybe where you are in the world, you might also get a chance soon (hello, Southern Hemisphere)? If not, I have old school stove-top instructions/suggestions too. I have just one note and that is to make this drink with as little or as much of everything. Some people like more alcohol than other and some don’t like it at all. In that case, simply substitute the alcohol with more tea and sparkling water. 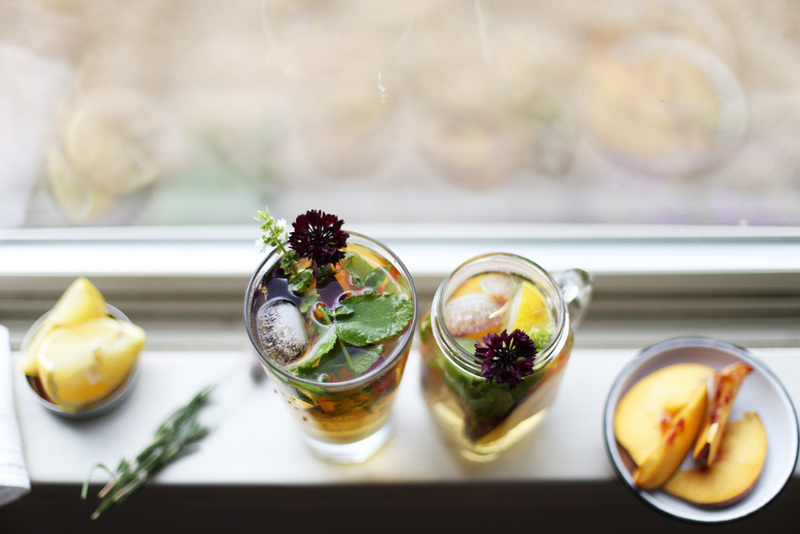 Add the water and loose leaf tea to a tall glass jar and let it sit in the sunniest spot outside for a whole day. Strain the tea leaves and refrigerate until ready to use. If you’re going to make the tea on the stove, try to make sure your water isn’t over 185 degrees F while steeping else the tea could turn bitter. Bring water to a boil and pour the water over the tea leaves in the jar. Cover and let it steep for about 5 minutes. Strain the tea leaves and let it cool. Refrigerate until ready to use. Add a little more than a 1/2 cup of the tea (4 fl oz), tequila, Triple Sec, lemon syrup, a mix of herbs to a tall glass jar or a cocktail shaker. Shake the mixture with ice and pour into 2 glasses. Top with sparkling water. Add 3 peach wedges to each glass and garnish with a wedge of lemon or a peach. Add all the ingredients to a saucepan and bring to a boil on high heat. Stir to help the sugar dissolve. Let it boil for 1 minute without stirring and then take it off the heat. Let it cool. Pour in a clean bottle and store in the refrigerator for up to 2 months. Previous Post: « How to be the best. Ah the photos here are just beautiful, lady! Love them so much! Thanks, Brooke. Hope you’re doing well. I’m going down the list commenting on #drinkthesummer posts so eventually I’ll get to yours. I did see it though and +1 for the spice and tomatillos. Love to you. This is oh so pretty, and I love your reflection on the closing season. I’ll do just as you suggest and hang onto every last day — and when the time comes, I’ll plunge into the cooler weather and all the glory (hot toddies! casseroles! boots and coats!) that comes with it. Cheers!